Why Stage III. The ultimate audio cable. Now at True Audiophile. Are we crazy? Isn't True Audiophile all about best value for the audio dollar? These cables are expensive! No we're not crazy. While much more than other brands including the other we carry we feel Stage III represents the best of category. When compared to cables costing twice their price these cables will hold their own or surpass those cable. That's the True Audiophile concept. The best performance for for its price point. Stage III is very unique in a crowded world of cabling. To begin with the man behind Stage III is a master sculptor no detail however small escapes his eye. This means all the metals used are produced by a metallurgist to the exact recipe of Stage III. No one makes their own connectors or conductors like Stage III does. Nothing is off-the-shelf or reproducible. All terminations inside and out are done by hand with a special method that insures the finest dielectric and conductors in the world. Inevitably, all cables will alter an audio signal to some degree, but the reactions that cause this can be manipulated and kept at a minimum to achieve optimum performance; maintaining the signal as close as possible to the original. Capacitance, inductance and resistance (or impedance) are the primary factors involved in defining an audio cable's performance and sound. These variables can be precisely balanced through a calculated choice of a cable's conductor type, dielectric (insulation), spacing, geometry and shielding. 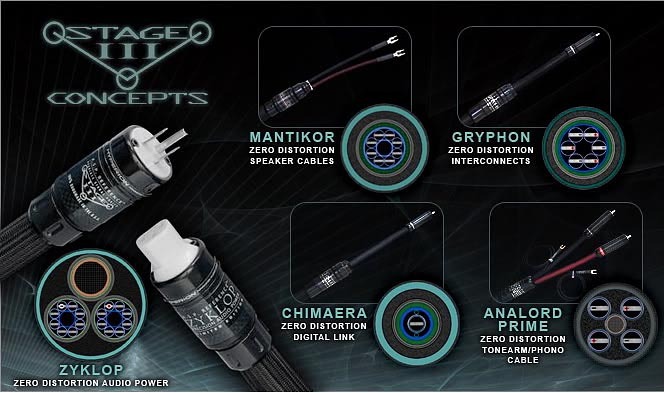 Stage III has also included data on its new and fully exclusive Hyperion Audio connectors.